"It's incredibly important that the entire industry recognizes that we have to work with the regulators, we have to work with the system,” said Garlinghouse. Major resistance level forming at $0.85, could lead to more losses. Ripple declined sharply from a high of $0.91 to lows of $0.81 during the trading session on Wednesday. The cryptocurrency is trading double tops with the attempts to recover, but it is capped at $0.87 which is now acting as a major resistance level. The declines broke past the support level at $0.85 which triggered further losses. XRP/USD price is currently trading at $0.85. "It's incredibly important that the entire industry recognizes that we have to work with the regulators, we have to work with the system. The blockchain revolution is happening from within the system it's not going to happen from outside the system." 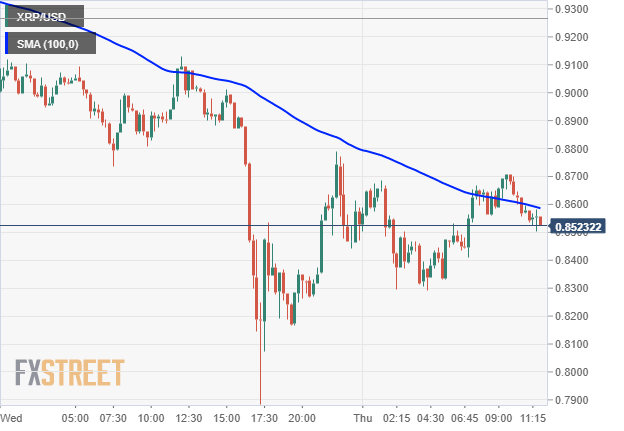 Ripple price recently traded at lows of $0.7877; however, the price managed to recover and pushed the 50% Fibonacci retracement level of the previous swing high of $.9236 to a low of $0.7877. The upward gains could not be sustained and were capped at $0.8870 level. There is a major bearish trendline forming at $0.85 which could lead to further declines. On the upside, the resistance level $0.87 is a major hurdle in the price recovery. If Ripple price moves above this level, more gains could be realized with the price nearing $0.9000.